The two Be@rbricks on the right are obviously similar. 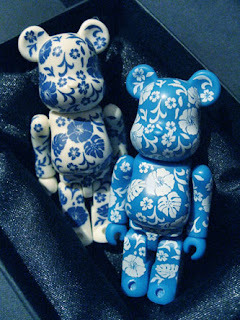 From the pattern to the color scheme (a cross between Hawaiian floral shirts and traditional 'blue and white' Delft pottery from the Netherlands, seen below left). But mind you, they are quite apart in terms of rarity. There is 13.54% chance that you can get on the right, and only 1.04% chance that you'll find the one on the left! Rarity is a come on, but it's definitely not everything when it comes to Be@rbrick collecting. (I mean, EXTREMELY RARE PICS of strange Asian cockroaches maybe on sale at Yahoo Auctions – true!!! – but the very thought of bidding makes me wanna throw up!) My thinking: hard-to-find or commonplace, design comes first!